Refrigeration air conditioning apprentices at Bradford College are able to hone their skills on state-of-the-art equipment thanks to donations worth more than £30,000. Four businesses have gifted the latest machinery to the College’s apprenticeship provider, City Training Services. 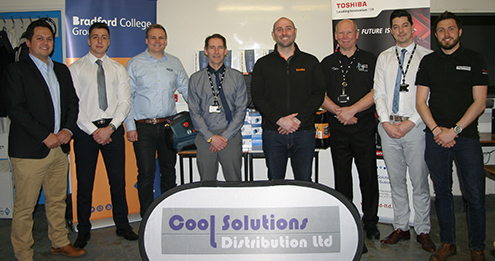 The generous quartet – Cool Solutions Distribution Ltd, Advanced Engineering Ltd, Testo Ltd and Blue Diamond Pumps – have handed over air conditioning units, condensate pumps, refrigerant recovery units, a digital vacuum gauge, Bluetooth manifold sets. So up-to-date is some of the equipment that it is not even released to industry until the end of May. The college has former student Matthew Worsman to thank for arranging the donation. Matthew, who completed a refrigeration apprenticeship with Bradford College and City Training Services, is now technical manager at Leeds-based Cool Solutions Distribution Ltd, which provides Toshiba air conditioning systems to contractors and employers. Through his contacts within the supply chain, he was able to tie-up a deal to supply the College with the very latest in equipment. A spokesperson for Cool Solution Distribution said: “Cool Solution Distribution Ltd recognise the importance of the next generation of engineers entering our industry being up to speed with the latest and most technologically advanced equipment on the market. “As an ex-student of the College, our Technical Manager, Matthew Worsman, saw an opportunity to give something back to the college through the network of manufacturers that we work hand in hand with and has managed to organise the equipment. Toshiba, the major player in refrigeration and air conditioning, will also be providing some additional training through Cool Solutions. Luke Levens, Sales Manager at Advanced Engineering, which donated £8,000 of Bosch refrigerant recovery machines, said: “Our partners at the College have been doing some really great work training our next generation of air conditioning and refrigeration engineers, so it was very important to support their efforts in any way possible. “And what better way than ensuring they have the right tools for the job from the outset? These brand-new units give learners a great opportunity to experience our industry’s technology first-hand and that will enhance their prospects, as well as their employers’ and our industry’s too. Trevor Hoyle, Training and Performance Manager for Construction at the College, said: “We are delighted with the equipment and extremely grateful to the businesses for their generous donation and to Matthew for making it happen. Read more about refrigeration air conditioning apprenticeships available through City Training Services.